The assets panel in Sumerian collects shareable assets in the scene. When you add an asset to a scene, Sumerian automatically adds it to a default pack in the assets panel. Entities that you create are not automatically added, but you can drag them from the entities panel into the assets panel to create an entity asset. Entity – A Sumerian entity. If you import a file or asset pack, drop the entity from the assets panel onto the canvas to add it to your scene. Gesture map – A document that maps gesture animations to trigger words in a speech asset. Mesh – A polygon mesh from a 3D model. Skeleton – A skeleton from a 3D model. Animation – A collection of animation clips from a 3D model. Clip – An animation clip from a 3D model. Material – A material component with textures for each renderable layer generated from a 3D model. Sound – An audio file for use with a sound component. Speech – A text file for use with a speech component. JSON – A JSON file that can be used as a parameter input on a script component. Skybox – A collection of textures that can be added to the background of the scene in the scene's environment settings. Behavior – A collection of actions that can be added to a state machine component. Texture – An image file that can be added to layers of a material component, a 2D graphics component, or a skybox. To add an asset to a scene, you can drag it from your desktop directly onto the canvas. Depending on the file type, the editor creates an entity in the entities panel, and one or more assets. For example, when you add a JPG image to a scene, you get an image entity in the scene, a material asset, and a texture asset. Drag a file from your desktop file browser onto the canvas. 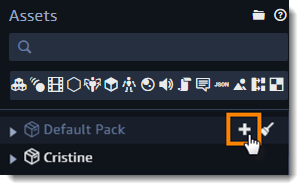 Create a blank asset by clicking the plus icon next to the default pack. To see the icon, select the pack name. Choose the asset in the assets panel and modify it by using the options in the inspector panel.